Kastelorizo island in Greece. Megisti. Accommodation. Ferries. Kastelorizo, or Megisti, is located east of Rhodes and belongs to the Dodecanese islands. It's a very small island, both the surface and the number of residents, here lives about 490 people, the surface is only 11 km2 and the highest peak - Vigla - measuring 273 meters above sea level. The island's location is unique in the Greek islands. Kastelorizo is located 118 km east of Rhodes and 2.5 kilometres from Kaz in Turkey. Further east than this, one can not get in Greece. Is it not strange that an island can be as far away, and so close to another country, and still belong to Greece. Kastelorizo is on the whole a strange island, and it depends on the location. Unfortunately, the isolated location, or rather its strategic location, has resulted in one or another tragedy. 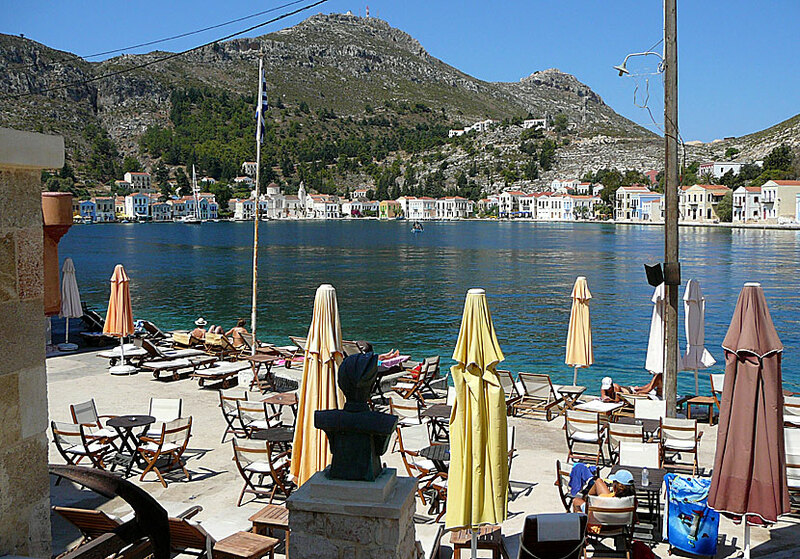 The history of Kastelorizo is cruel, bloody and tragic. We do not need to go far back in time. The Italians took over the island in the 1920s. Then, many inhabitants chose to emigrate, most fled to Australia. The last (we hope) disaster occurred during World War II when the island was bombed by both the Italians and the Allies. During one of bombing attacks a fuel depot bursted into flames. The fire spread quickly and destroyed more than half of the houses on the island. Those who had not already fled before did so now. As refugees, they were not welcome either in Turkey, Cyprus or in what was then Palestine, despite persistent attempts. Finally they found a refuge in Egypt. Once the war was over, most of the islanders returned home. They were faced with a village laid in ruins. Then, most chose to emigrate to Australia. 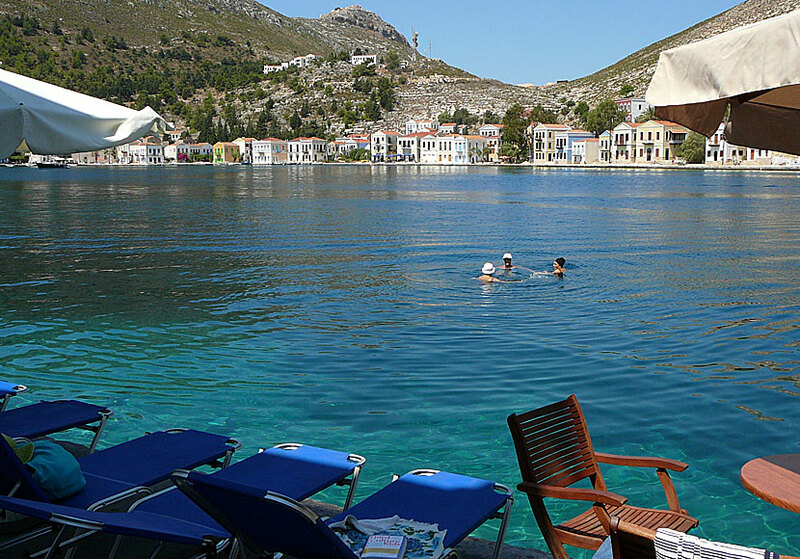 Kastelorizo is today a quiet and tranquil paradise. In the beginning of the 20th century Kastelorizo had a population of about 10,000 people, after the war there were only a few hundred that stayed. 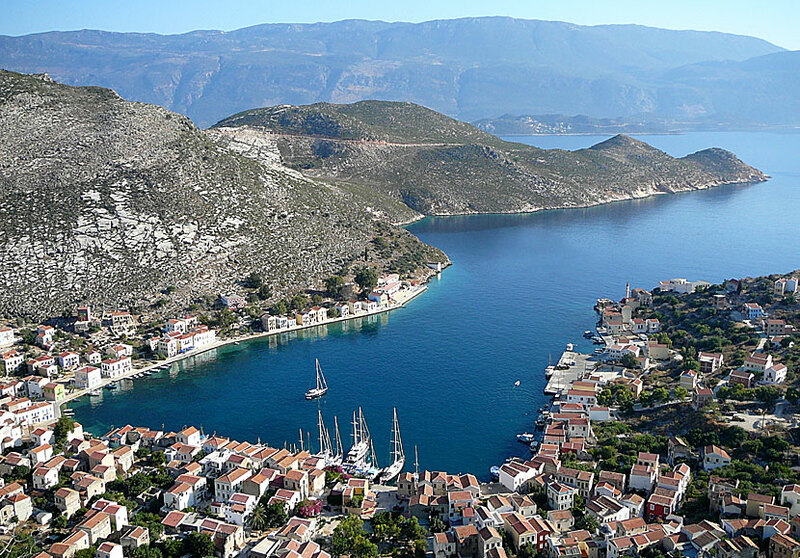 Today, Kastelorizo only has 490 inhabitants. In Australia, it is said to live more than 30,000 people that have connections to Kastelorizo. They are called "Kazzies". On July 19 every year, it is a big party in Megisti. This is not an ordinary party, it is the craziest and funniest party we have experienced in Greece. Do you like Italian movies? 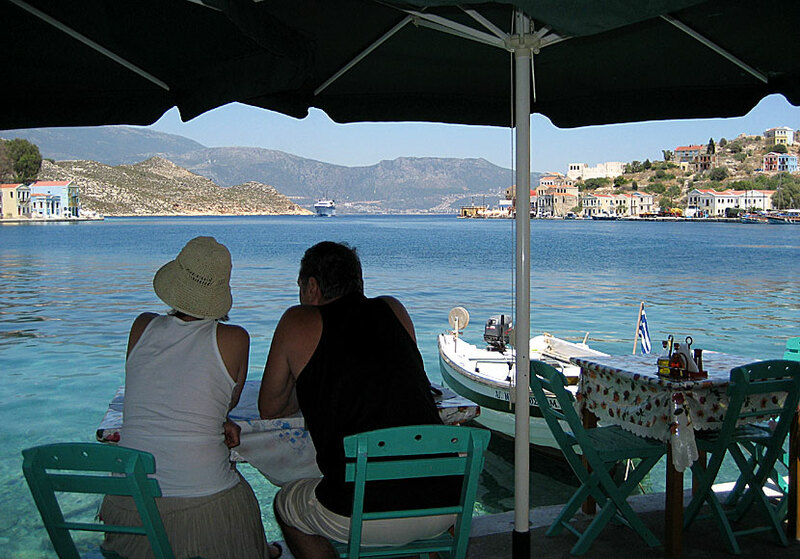 I can recommend the film Mediterraneo, which takes place on Kastelorizo. Go by air to Rhodes, and continue the journey with ferry or domestic flight. 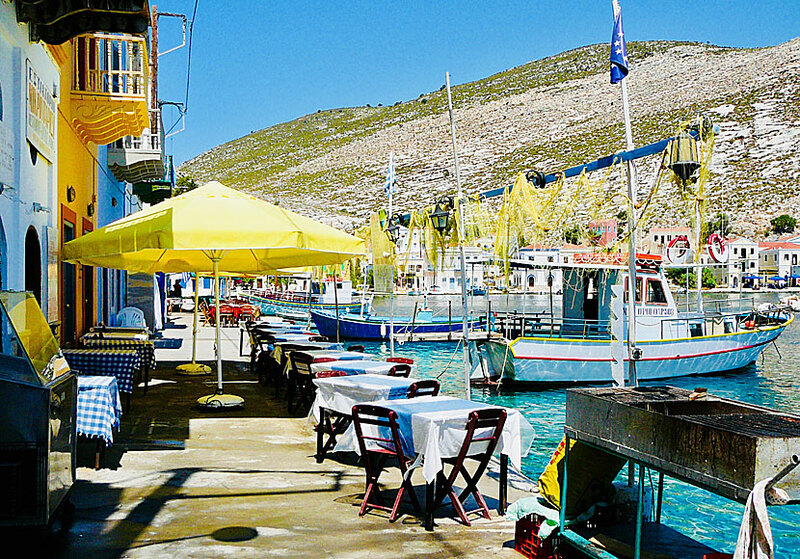 The boat connections between Rhodes and Kastelorizo are quite good nowadays and the fast catamaran Dodekanisos Express, which runs from Akandia Port in Rhodes town, as well as some ferries. There are domestic flights from Rhodes five days a week. Book in good time. Since there are no roads, except for the one who goes to the airport, there are no car or moped rental services. The only taxi, and the only bus, serves the airport. 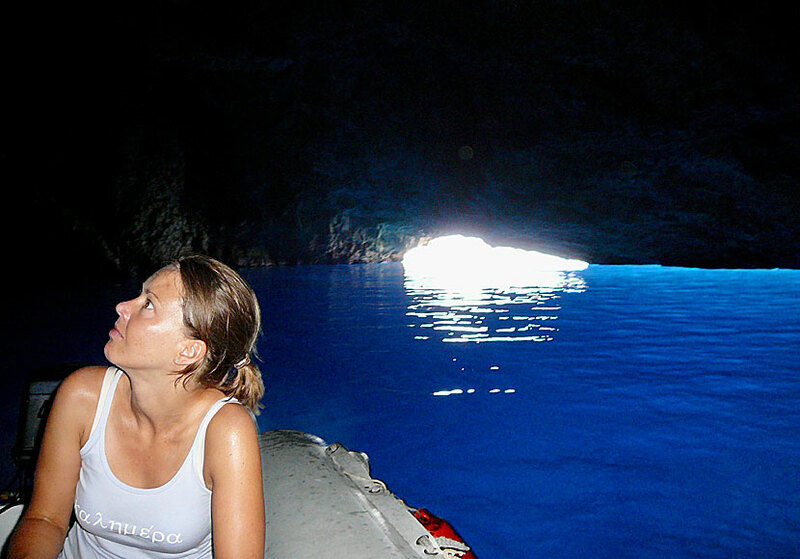 With excursion boat you can go to the Blue Cave, which is described under sights. Boats to Kaz in Turkey go a few times a week. If you're going to Kaz, you must contact one of the travel agencies a day before. Bring your passport. You sit so close to the water that you can jump in after lunch. 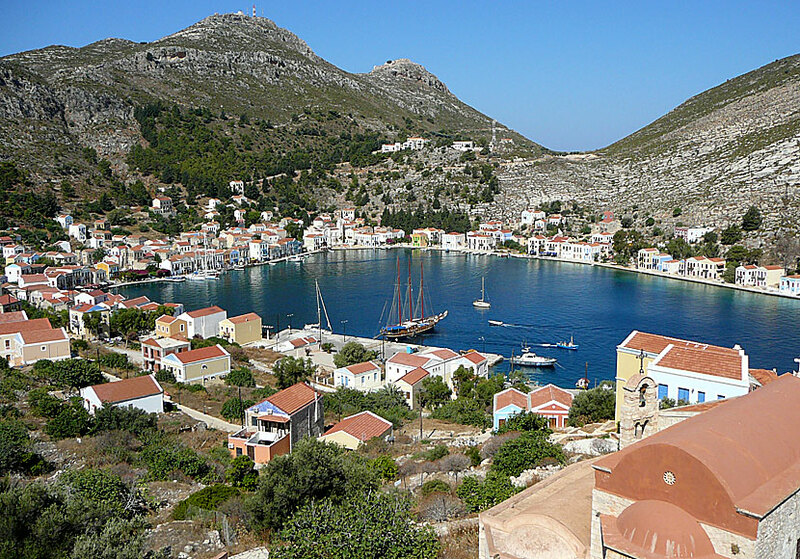 The only village on Kastelorizo is called Megisti. It is one of the most beautiful and photogenic villages I've visited, and that despite the fact that many houses still are ruined, or perhaps because of it. Almost everything on the island circles along the narrow and poetry beautiful promenade (see picture on top). Tavernas and bars are located in a long line after another. The best - and cheapest - are a bit away from the port area. The most expensive is where the sailing boats berth. Little Paris and Restaurant Sydney are the best tavernas. Mandraki bay to the left of the port. One of the buildings that were not destroyed when the island was ruthlessly bombed during World War II is a mosque. In the mosque there is an exhibition about the island's distressing history. When we were there a film about all the atrocities were shown. The film was well made and very touching. Both of us were moved to tears. See it if you come to Kastelorizo. The narrow and beautiful harbour promenade in Megisti. Kastelorizo is the only island I've been to that are lack of beaches. It sounds crazy, really, there should be at least one poor little beach, but there isn't. Instead you have to depend on the harbourfront promenade where there are sunbeds and umbrellas for rent, and bathing ladders to go up and down in the sea. It works without any problem. There are no beaches so you swim in the harbour basin. The village Megisti and the Blue Cave are the major attractions. 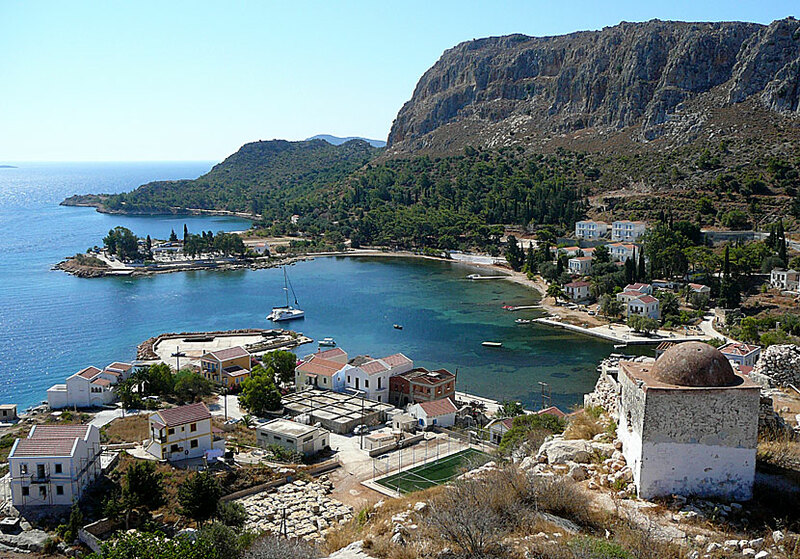 There are also a few monasteries which are on the way to the airport, an ancient Lycian tomb from the 5th century BC, and the island's old capital Paleokastro located in the mountains above Megisti. I highly recommend a hike to Paleokastro, not to see Paleokastro but for the breathtaking view over Megisti and over the mighty mountains of Turkey. Getting there is easy and requires only strong knees. The steps start out in Megisti. You can not miss it. See picture of the view further down. Blue Cave. The entrance to the cave is lit by the sun outside. The Blue Cave is said to be the biggest, bluest and most amazing cave in Greece, some say in the whole Mediterranean. Before I saw the cave the first time, I was sceptical. I do not know how many "Blue Caves" I have seen in Greece. Some I have been impressed of, but most ones I gave a shrug of the shoulders at, but not this one. The cave opening is about one meter, it is only possible to come inside the cave with a small rubber boat, and you have to duck, otherwise you hit your head in the rock. Once inside the cave, it is only to notice that it is the biggest, bluest and most amazing cave that exists in Greece. The selection is limited, but large enough to accommodate the few tourists who come here. Almost all Greek tourists have their own houses, or they are staying with relatives. August is always a difficult month, then you should book in advance. Best is to always book rooms in advance. View of Megisti. Kaz in Turkey in the background.